After racking their brains and kicking around a few of different proposals, Valve has figured out how to rate servers automatically in the back end of Steam for Team Fortress 2. 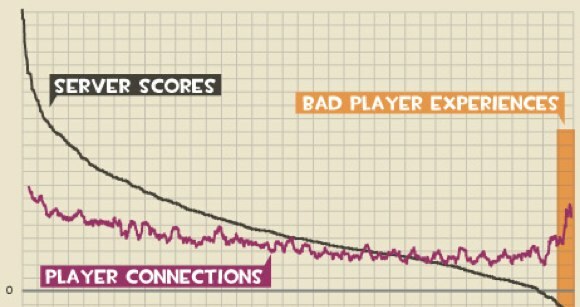 Valve's Robin Walker detailed how the system will work and help players in search of a decent game (Read: Not achievement farming): New servers begin with a score of 0, each time a player connects it loses 15 points but gains 1 point per player for each minute they remain inside (with a 45 point max per user). "In short," Walker writes, "servers that have lots of players joining & leaving rapidly will score badly." The rating will ensure players are walking into honest assessments of a server's quality -- sometimes server hosts write false descriptions to entice people to join. Well, with the new system those jerks can keep their phony servers because the first order of business on Valve's end is to completely "delist" them. The server breakdown (pictured above) shows last week's server statistics, ignoring all password-protected servers as well as servers had fewer than 200 connections per day. Walker also notes that Valve will continue to improve their ability to measure these types of server problems. Alert to all Jerks: Valve to rate Team Fortress 2 servers originally appeared on Joystiq on Fri, 13 Mar 2009 19:45:00 EST. Please see our terms for use of feeds.